This was the one multiple day trip that I was able to take this year. From the look of things on Friday, Nebraska would be under the gun both Friday and Saturday. There was a strong cap over most of Nebraska, but it looked like the edge would fire up some monster thunderstorms. Myself along with some others, decided to make a weekend of it and take a multiple day trip out to Nebraska. To make a long story short, the cap held on Friday and nothing happened. Saturday also looked very promising. We headed out to Grand Island Nebraska where we decided to head north. We ended up seeing a thunderstorm going up north of Grand Island, and we started to chase it. By the time we were almost to the South Dakota border, we were surprised to discover the storm was dying. We abandoned the chase and sat wondering what had happened and how such a weekend that had such a promise of severe weather fizzled out. It was then that we noticed another storm going up on the horizon to our west. Even though it was getting late, we decided to chase the storm. As we approached the storm, we could tell that it had a very intense updraft and that the storm was rotating. We moved slightly to the south and watched a developing tornado. Eventually we went back north and moved west to get a closer look. We were just west of Bassett Nebraska when a warning was issued. 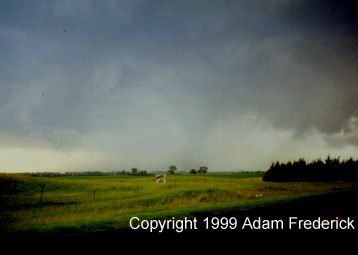 We approached the storm and eventually could see the tornado below wrapped in rain. It was a bit hard to see, but in the center of that picture was a tornado moving straight toward us kicking up dust in the field as it went. While we were watching this, pea to marble sized hail started to fall. Eventually, the storm got a little too close for comfort and we retreated to just east of Bassett. 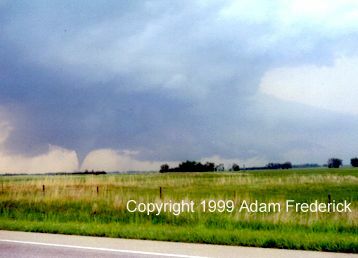 That is when we saw the best tornado. 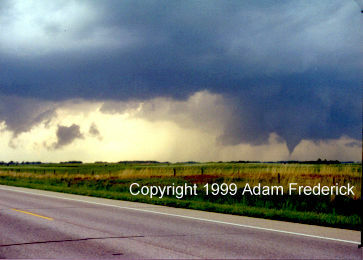 We were stopped and watching as the tornado slowly lowered from the sky and started kicking up dust and debris. We followed the storm north until the storm started to change into a high precipitation supercell. Since the storm was being wrapped in rain, and also since it was getting dark, we decided to abandon the chase. The only people that could chase safely now were the people from the University of Oklahoma who was on this storm with their Doppler on wheels. More pictures from this day can be found in the 1999 photographs section in the Photo Gallery.